Gas flaring is dangerous to our health and environment. There’s one way to stop it. Locally. 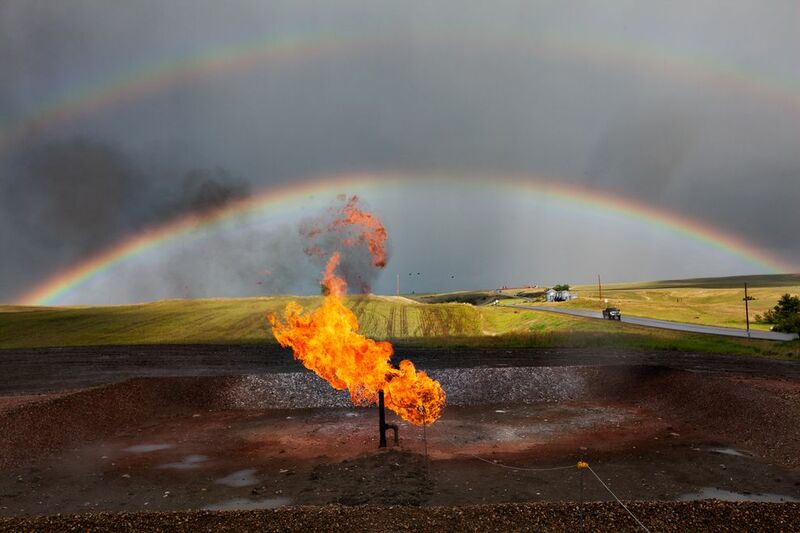 Gas flaring, the deliberate open-air burning of natural gas, is a practice common in the largest shale oil plays where natural gas is a byproduct of oil extraction. There are some legitimate reasons to allow limited use of flaring. After a shale oil/gas well is drilled and hydraulically fractured, a temporary flare is used during well production testing. Testing is important in order to determine the pressure, flow and composition of the gas or oil from the well. Flaring at the well site can legitimately last for several days or weeks, until the flow of liquids and gas from the well and pressures are stabilized. But once the flow is stable, the practice is dangerous and unnecessary unless required for safety reasons. Flaring releases methane, a greenhouse gas that, when released directly into the air, traps heat in the atmosphere. The process of flaring contributes directly to global warming. Flaring has a substantial impact on the health and environment of landowners who live near a flared well. The methane release is smelly, noisy, and, according to the Natural Institute of Health, exposure causes “headache, dizziness, weakness, nausea, vomiting, and loss of coordination” in people and animals. It creates a 24×7 bright light, blocking out the night sky. Flaring is a waste of a precious natural resource. In oil plays, where natural gas is an unwanted byproduct of oil extraction, flaring is common because oil is 30 times more valuable than natural gas. So rather than capture it and take it to market, it is destroyed — hardly an efficient way to treat precious natural resources. It’s also unnecessary. Technologies currently exist, and more are being developed, to capture natural gas at the wellhead, and natural gas can be used for purposes such as fueling generators at the well site. This is a huge problem. In the Bakken, about a third of natural gas produced through the process of oil extraction is flared. According to a study released this month by Earthworks, $854 million in natural gas has been burned as waste in the Bakken since 2010, enough to pay for solar panel installations in almost every household in Fargo. The 130 billion cubic feet of natural gas burned in just two oil plays — the Bakken and Eagle Ford Shale in Texas — has produced the equivalent of 1.5 million cars’ worth of carbon dioxide emissions. So, problem identified. We just need states to regulate flaring to curb this practice, right? If you’ve been reading this blog for awhile, you know the answer to that question. No. 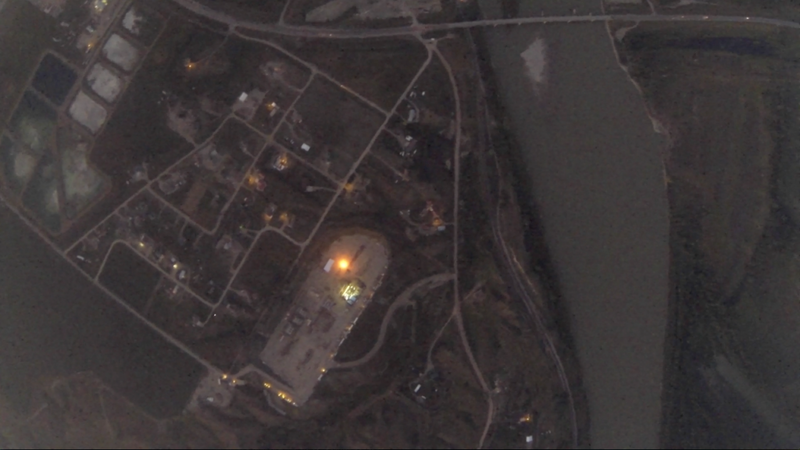 Photo of a flared well in the Bakken, shot from a high altitude balloon. Courtesy of Skytruth. Click to enlarge. The simplest and most direct way for states to regulate flaring might be to make companies pay taxes on the amount of gas they flare. In that way you can encourage them to move to wellhead methane capture. This isn’t done. North Dakota neither tracks how much companies pay in taxes on flared gas, nor independently tracks the volume of flared gas. Texas does not require producers to pay taxes on flared gas. North Dakota put regulations in place last June that the state says will eventually reduce flaring to 10% of natural gas produced, but the outcome is not clear because North Dakota has such a poor record of monitoring oil operations. Companies can also seek exemptions to the law, which North Dakota has consistently granted in the past. And Montana? You’ve got to be kidding. The residents of the Silvertip Zone in Belfry asked the Montana Board of Oil and Gas to prohibit flaring in the permit for the Hunt Creek 1-H well earlier this year, but the plea was ignored. If that well is fracked, as most expect it will be, it (and others that follow) will almost certainly be flared. This is why local citizen-initiated zoning is critical. If John Mork is successful in his goal of bringing the “Bakken to the Beartooths,” the only way to protect local landowners from this dangerous and destructive practice is to install local regulations to limit its use. That won’t keep mineral rights holders from getting their oil. It will just require oil operators to use the highest standards in extraction to protect our property, our land, our water, and our way of life. That’s not anti-business. That is not unnecessary government intrusion. This entry was posted in Fracking Information and tagged Bakken, citizen initiated zoning, Earthworks, Flaring, Natural gas. Bookmark the permalink. 8 Responses to Gas flaring is dangerous to our health and environment. There’s one way to stop it. Locally. There are some things not mentioned in this article that should be addressedWhen we are drilling a hole sometimes we will drill into a gas pocket and the pressure has to be bled off. If not you risk a blow out, the pressure literally blows all the pipe out of the hole in all directions. Up to 21,000 feet of it. On top of that you risk a rig setting fire and running into a wild well situation. Both have significant hazards to employees and the environment. So what we do to relieve the pressure is run our return line through a gas buster off the end of the pits. It separates the gas from the mud. Allowing the mud to run back thru the closed loop and sent back down hole. The gas is run about 200 feet thru a line to the flare where it is ignited and burned off. If we did not burn off the gas you risk the gas H2S being released into the environment. H2S (hydrogen Sulfide) is extremely deadly to people and animals. It tends to collect in low lying areas around the well and has a rotten egg smell. It only takes 10 seconds to kill you if exposed. The smell disappears from your senses rapidly and by then it’s about too late. We detect it using air sniffers and are taught through instruction to walk upwind to the edge of location if we suspect it or a alarm is triggered. It is so bad you can’t even stop to help a buddy if he goes down. You’ll both be dead. We then meet, take a head count and begin rescue attempts or recovery if necessary by dawning mask and oxygen. This is not the only gas released during a well control where we need to flare, and sometimes not even present. We also release sweet gas, or sour gas. But in either case they need to be burned off as the risk of H2S is possible. When a well is completed we pump a extra heavy weighted mud down called Kill mud. Because it essentially kills the well and stops all migration of gasses. Then the well is capped off and waits till the work over rig gets there to finish the well for production. But whenever you see a flare burning, it’s not great, but much better than gas just seeping into the environment.. Thanks for this information, which goes well beyond the level of detail of this article. I did say in the second paragraph above that flaring can be required for safety purposes. There are times when flaring is required, but the bulk of flaring in North Dakota, Texas and other shale plays occurs just because gas is worth much less than oil. I was very interested reading the perspective you added to this well written article and would like to possibly ask you some additional questions on the subject – I am doing research for a book that will be published later this summer and one of the chapters involves capturing flare gas to use in powering equipment for wastewater recycling. If you receive this, can you please go to our website and make contact with us?